The following analysis is from rSpieker found at CIT forum. I've corrected some spelling and formated his hyperlinks. 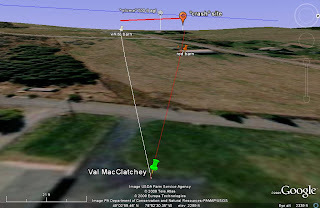 Most of you will know the famous ©opyrighted picture of Val McClatchey showing a mushroom cloud over the "crash-site" allegedly seconds after the crash of UA 93. For an overview see the following pictures of an analysis provided from rumpl4skn. Note that in the pictures above the cloud fits perfect between the red an white barn. We will use them later as reference points for the diameter of the cloud. And please note that the shape of the cloud is quite sharp and clear. "It turns out to be the very first photo taken related. It’s -- timed it out -- it was approximately 5 seconds after impact that I snapped the photo." ...I found some more aspects to endorse the impossibility of this picture. - the influence of wind and turbulences. With a little geometry we´ll find that the top(!) of the cloud has to climb at least 380ft agl to come in sight. Note that our POV is about 40ft higher than that of Vals camera. Distance to the cloud is about 1.4 miles. View is to the west, the blue line indicates the direction of wind from NW to SE, windspeed at that day was 9-12 mph means Beaufort 3. For the horizontal movement of the chimney at 9-12mph we need between 55 and 73 seconds to come in position. For the vertical climb I tried to clock the expansion rates of the wtc2 fireball, result about 35ft/sec in the very first seconds means we need 65 seconds for Val's cloud. A research for the climb rates of stratospheric balloons gave me values between 10 and max 50ft/sec. So if we want to believe at this point that this mushroom cloud existed, then we have to accept that it is at least 1 minute old (the "crash" being t=0 in this example). To be fair subtract the 8 seconds the explosion-sound needed to travel to Val. 52(!) seconds is another dimension than her claim that it had been only 5 seconds. And the cloud is long time disconnected from the "crater"! But a strong source of energy and smoke is absolutely necessary to conserve a constant climb rate and the clear shape of the cloud. See yourself in the videos and pictures from the WTC and the Pentagon how the smoke-plume develops ans fades! A 21-sec video showing the shockwave and typical black smoke cloud from a detonation of 350lb of pure TNT you can see here. Note: When the energy is gone the clear shape of the cloud fades away. This is due to the natural turbulence of the air even at very low windspeeds. Most people aren't aware of it but there are more than 1,000 micro-gusts per hour. Source: Lecture "Properties of turbulence" , pages 3 and 4. Now see that even a smooth movement of a human body results in chaotic motion of the air (52 secs). What we didn't take into account at this point is the additional strong turbulence caused by thermals. Aviation experts define turbulence as random, unpredictable motion that occurs at the boundary between layers of air moving at different speeds. Just as the smooth flow of an ocean wave breaks up into a maelstrom of swirls and eddies when it crashes on the shore, uniformly moving layers of the atmosphere that brush against each other fragment into vortices, and other small-scale disturbances. Turbulence is often triggered when energy released by the sun-warmed ground or by a group of forming clouds heats a parcel of air at low altitude. The heated parcel rises, distorting the wind-flow pattern at higher altitudes and generating chaotic motion. If some way a "mushroom cloud" existed in the very first seconds, there is absolute no way under the atmospheric conditions of that day to keep it stable so long that Val McClatchey's camera had a chance to "see" it. This spells the definite "End of Serenity" for Val McClatchey's picture. 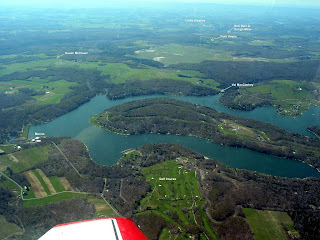 rSpieker has also found this nice aerial photo of the Shanksville area.